Gravel is the longest White Canyon tributary, cutting through the cream colored Cedar Mesa sandstone for over 15 miles, and like all major drainages in this region has long stretches that are sheer sided and quite deep but rather wide, with a flat rocky floor, and interrupted by short very narrow sections containing pools and drop offs that may require rappelling, wading and/or swimming to pass through. 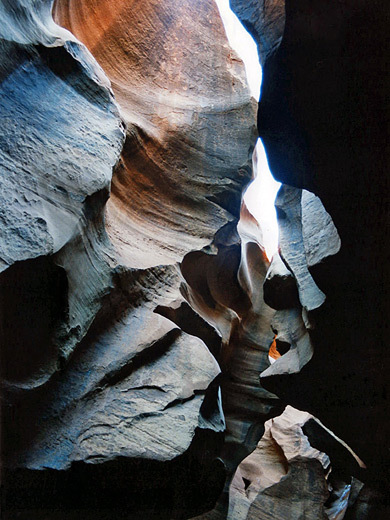 Above the canyon is a great expanse of level white slickrock framed by low, crumbling red mesas, and the gorge has plenty of entry/exit points so for those without ropes most can be seen relatively easily by climbing the cliffs to bypass occasional obstacles. A hike along the canyon is still rather strenuous though, especially through the upper sections. The quickest way to explore some of the canyon is to park near UT 95 and walk up the lower end, at least as far as the first blocking dryfall; this is the hike described below. The parking area is on a plateau overlooking White Canyon, a short distance along an unsignposted side track that leaves the highway at mile 64.8 (15 miles south of Hite at the north end of Lake Powell), which is a good place to camp as well as park. From the plateau, the track zig zags down into the canyon, crosses the streambed then continues a few miles northeast to the base of a mesa known as Jacob's Chair. Reaching the upper end of Gravel Canyon, where most of the best narrows are found, requires one or more days backpacking or an approach on dirt tracks through the western edge of the Abajo Mountains. The full length of the canyon should be explored in the downstream direction starting at the top, and this hike is sometimes done as a loop, combined with a trip up nearby Long Canyon. This takes about 4 days. 7 views of Gravel Canyon. TopoQuest topographic map of Gravel Canyon. The White-Gravel junction is reached after 10 minutes walking upstream from the parking area close to highway 95. 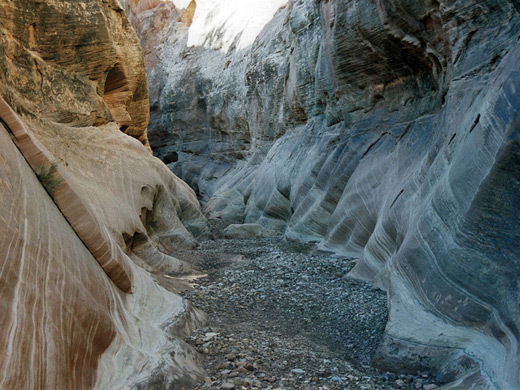 At this point both canyons are rather shallow, just 50 feet deep, though the walls are still mostly sheer, formed of the multilayered white sandstone typical of this region, which forms cliffs of thick strata between thinner ones, often stained black by iron deposits from rainwater. The lower end of Gravel Canyon has plenty of trees and boulders at first, plus occasional pools, but is quite open, with a flat floor of sand or pebbles that makes for easy walking. After a while the cliffs become closer, the bushes fade away and the canyon enters a nice stretch of medium width narrows that lasts for about half a mile. The rocks here are light grey with a pinkish tint, crossed by many fine light colored bands and eroded into smooth curves. Some parts of this section have standing water most of the year, in places several feet deep and quite lengthy; swimming may be needed on occasions. The narrows end at a little curvy pour off above which the canyon is wide again, a pattern which repeats for the next 13 miles or so upstream; long open parts then short slot sections with pools and dryfalls. Often benches form at either side of the canyon and may allow the dryfalls to be easily bypassed, as well as providing an alternative to walking in the streambed, which may be wet or muddy. Continuing upstream, the next narrow part is found shortly after a small side canyon on the north side - a short, dark passage that ends at a pool beneath a high dryfall. This can be passed on the left, then around a wide U bend is a short narrow channel leading to a cave-like hollow, a big circular pool and a colorful, swirling slot in the ceiling above. This time there is no easy way to pass, and continuing up canyon is possible only by regressing a little, climbing right out of the gorge then back down above the dryfall, and so this point is a good target for a half day hike, taking 2 - 3 hours to reach from the car park. The return can be either back along the canyon or the flat land above the rim; walking is very easy here, across the flat, open slickrock with just occasional bushes and cacti.